Mike Smith's performances in two Grade 1 Kentucky Derby and Oaks preps earned the Jockeys' Guild Jockey of the Week title for April 2-8, 2018. The award is voted on by a panel of experts for riding accomplishments by members of the Jockeys' Guild, the organization which represents more than 950 riders in North America. Jockey of the Week is sponsored by Animal Element's Foundation Detox and Product X Performance Enhancer. On a weekend with three Kentucky Derby prep races, multiple graded stakes, and the opening of the Keeneland Spring meet, jockey Mike Smith stood out to voters as the leading jockey by total and stakes earnings for the week and as one of only two jockeys to win three stakes. 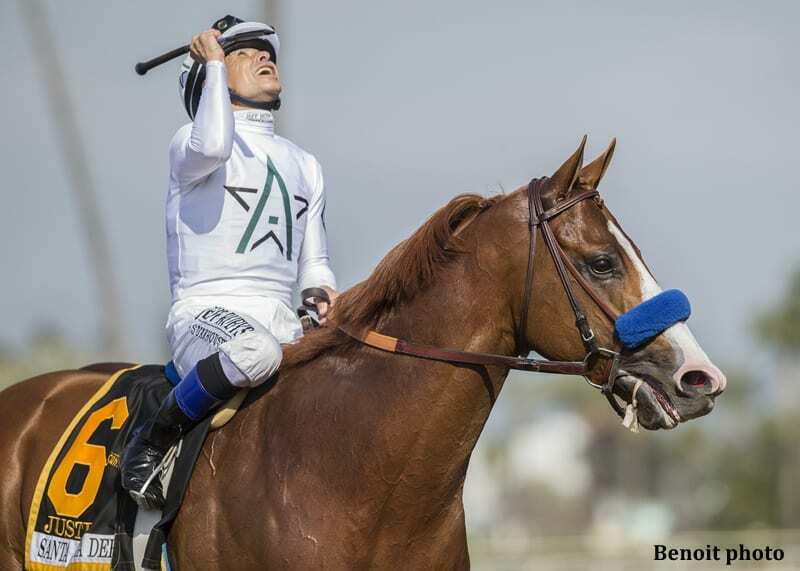 Smith won one of the feature races of the weekend, the $1,000,000 Santa Anita Derby (G1), a Kentucky Derby prep race worth 100 points to the winning horse and an historical producer of classic winners. Smith was aboard Bob Baffert-trained Justify ($3.80), now undefeated in three starts. The pair commanded an early lead and maintained it to win by three lengths over Bolt d'Oro, the narrow second-choice favorite. In addition to ensuring Justify would have enough points for the Kentucky Derby, Smith also brought home the winner of the $400,000 Santa Anita Oaks (G1), Midnight Bisou ($3.20). Smith employed an opposite strategy with the Midnight Lute filly than on his mount in the Derby, relaxing her early in the back of the pack before closing from eighth place to win by over three lengths. Earlier on the card, Smith won the $200,000 Echo Eddie Stakes with Heck Yeah ($5.20) by over two lengths in a dirt sprint for Cal-bred or Cal-sired 3-year-olds, also for trainer Bob Baffert. The leading rider by total and stakes earnings last week, Smith earned $1,008,740 last week in total and $1,004,345 in stakes. In his 11 starts, he notched three wins, one second-place finish and one third-place finish for a 28% win rate and a 45% in the money rate. In his career, he has won 5,455 of his 33,068 starts and has career earnings to date of $309,059,585. The Hall of Fame jockey and two-time winner of the Eclipse Award for Outstanding Jockey is currently ranked tenth among all North American jockeys by earnings in 2018, with $2.95 million year to date. He ended 2017 as the second highest-money earning rider in North America with $26.54 million earned. This entry was posted in NL List, People and tagged Bob Baffert, heck yeah, jockey, jockey of the week, jockeys guild jockey of the week, jockeys' guild, Justify, midnight bisou, mike smith, santa anita, santa anita derby, Santa Anita Oaks by Press Release. Bookmark the permalink.